Posted Friday, Nov 1, 2013 12:01 AM EDT by HAMILTON SPECTATOR & filed under Cancer. Cancer: A Code Red Project is a groundbreaking seven-part series which examines the role of socioeconomic factors on the chances of getting cancer and the chances of surviving it. The Spectator’s Steve Buist analyzed 10 years’ worth of Cancer Care Ontario data down to the neighbourhood level. 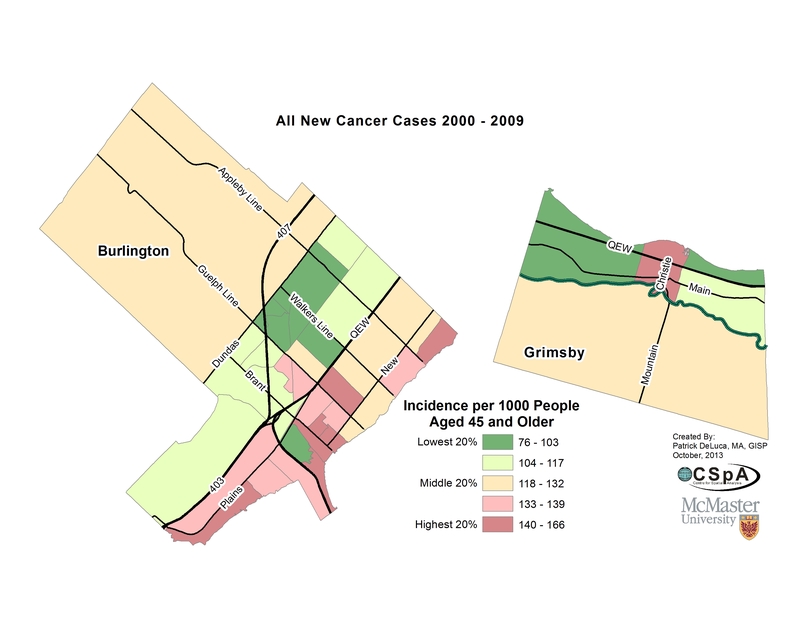 Today we look at cancer rates in some of Hamilton’s neighbouring communities — Burlington, Grimsby and Brantford. 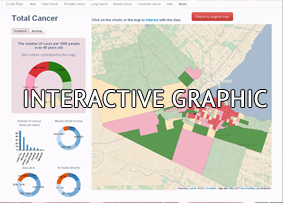 TO FIND CANCER RATES IN YOUR NEIGHBOURHOOD, CLICK HERE. FOR THE PDF OF THE HAMILTON SPECTATOR PAGE, CLICK HERE. The overall rate of cancer incidence in Burlington is about 6 per cent higher than the comparable rate for the rest of Canada, but the overall mortality rate is nearly 3 per cent lower than the Canadian death rate. Lung cancer incidence and mortality in Burlington is about 20 per cent lower than the rest of Canada. The prostate cancer mortality rate in the former City of Hamilton is more than 25 per cent higher than the comparable rate in Burlington. 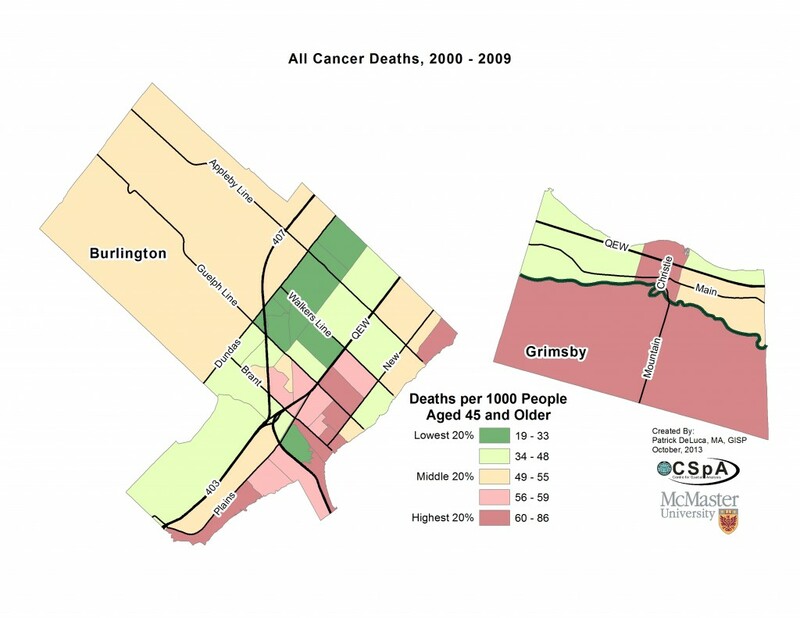 Cancer death rates in Burlington are about the same as they are in Stoney Creek and slightly higher than the mortality rates in Ancaster and Flamborough. The overall rates of cancer incidence and cancer mortality in Grimsby are almost identical to the comparable rates for the rest of Canada. Lung cancer incidence and mortality rates are less than half the rates found in Hamilton’s inner-city core. The incidence of colorectal cancer in the former City of Hamilton is about 14 per cent higher than the rate in Grimsby. The breast cancer death rate in Grimsby is virtually identical to the rates found in Burlington and the average of Hamilton’s five suburbs. The overall cancer incidence rate in Brantford is about 12 per cent higher than the comparable rate for the rest of Canada, while the cancer mortality rate is about 20 per cent than the Canadian death rate. The incidence and mortality rates for lung cancer and colorectal cancer in Brantford are almost identical to the rates found in the former City of Hamilton. Brantford’s mortality rate from prostate cancer is about 24 per cent higher than the comparable rate for the rest of Canada.